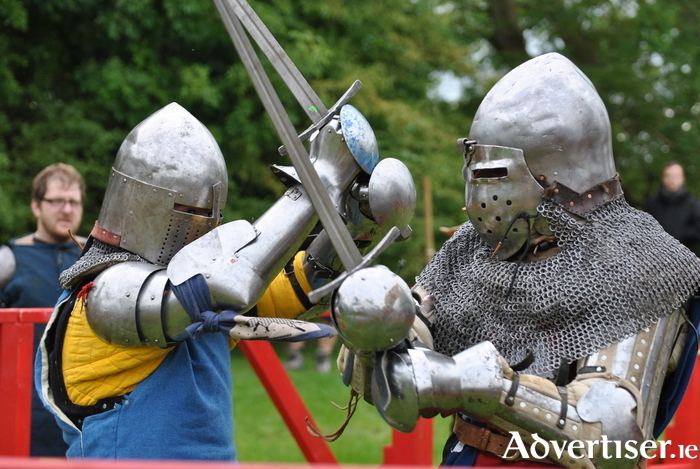 Advertiser.ie - MEDIEVAL TOURNAMENT MAKES A COMEBACK IN IRELAND!! The first, full-contact, medieval tournament in Ireland for over 400 years happened at Claregalway Castle in 2015 and returns this weekend September 30th to October 1st from 12pm-6pm. Armoured knights from across the globe will descend on the fantastically restored 15th-century Towerhouse Castle for this very unusual, but very real, martial arts tournament. The sport of full-contact medieval combat is not for the faint-hearted; wearing full medieval armour, with sword, axe or mace in hand, the competitors will be going toe to toe in a brutal and exhausting contest of strength, speed, and above all, skill. A huge range of attacks is allowed, from strikes with the weapons, to shield punches, throws, kicks and headbutts. The tournament is divided into three one-on-one categories: pole weapons, longsword and sword and shield. Fighters score points for solid hits, similar to the scoring system in boxing. As well as the individual categories there is also a brutal three-on-three group category, where the winner is decided by the last team member standing. As well as all the fighting there will be a great selection of medieval fun on offer including jesters, fire jugglers, wonderful music, have-a-go archery, displays on medieval life, talks on the goriest aspects of medieval surgery, and much more. Nemo, the Medieval Magician, will be there throughout the weekend. Master Bowyer, Jack Pinson, will demonstrate how to make your own bows and arrows. Sile na Sleibhte, storyteller and soothsayer, will also be there to help you predict your own past! If you like to dress for occasions then why not come wearing some hint of medieval costume and participate in the Medieval Fancy Dress Competition. Fabulous prizes to be won in both children’s and adults’ categories. A limited number of costumes will be available for hire at the castle from visiting Lady Clara Reynard. Veteran living history interpreter and field archaeologist Dave Swift will give demonstrations on the Late Medieval period c.1500-1600, focusing on Connacht's (and Galway's ) greatest medieval battle, the 1504 Battle of Knockdoe. Recreated artefacts on display will include swords and other melee weaponry, armour, ceramics, clothing, leather goods, coinage and a ballistics display showcasing musketry and archery. Admission at the gate to Claregalway Castle: Adults €10, Children €5. Guaranteed to be a hugely enjoyable event, with something on offer for all ages and interests, and a unique opportunity to see the medieval ages brought back to life.